Our study centres are open from 8.30am - 5.30pm (UK time), from Monday to Friday. Located in attractive, safe parts of West London, our centres are both in Travel Zone 2. 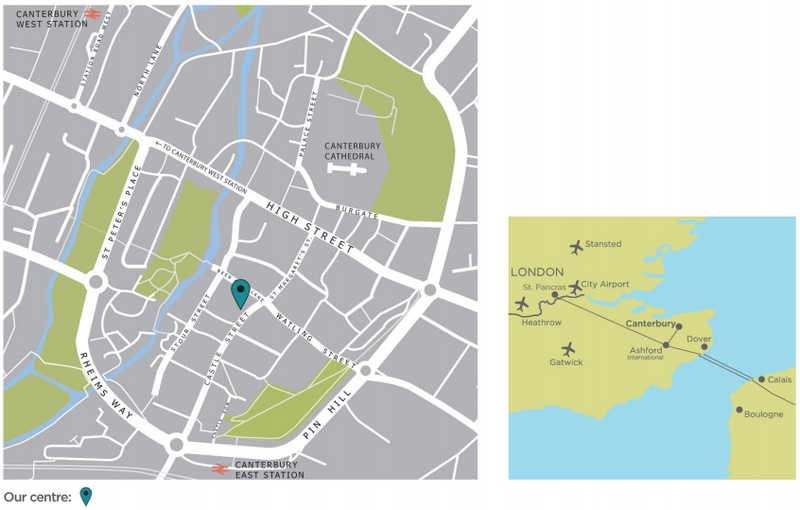 Our Canterbury school is well-located, five minutes walk away from the historic city centre, which is a UNESCO World Heritage Site. The closest station to our Holland Park Gardens centre is Holland Park, which is served by the Central (red) Underground line. Exit the station and cross the traffic lights right in front of the station and turn right. Walk for 6 minutes, or 0.3 miles, taking the second left turn into Holland Park Gardens. The school will be on the left. If you have any problems, please call us on +44 (0)20 7605 4123. Take a District Line (green) London Underground train to Stamford Brook. Exit the station, cross over the road and turn right. Walk down to the main road and turn left. Westcroft Square is the first road on the left. We are at Number 65 – the first building you come to on the left-hand side. The walk should take around 3-4 minutes. If you have any problems, please just call us on +44 (0)20 8563 6500. Canterbury has good road and rail connections to the rest of Britain as well as continental Europe. It is 30 minutes from the Eurostar service at Ashford International station, the port of Dover and the Channel Tunnel car terminal at Folkestone. For all points of arrival and departure, including all London Airports, a guaranteed transfer service can be arranged if requested. If you have any problems, please just call us on +44 (0)12 2776 0000.